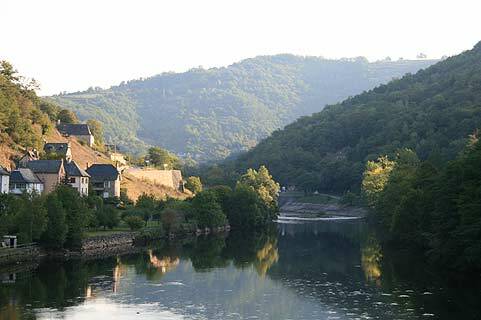 Entraygues (full name Entraygues-sur-Truyere) is situated in the Aveyron department on the Lot River - which is also joined by the Truyere River in the village (hence the name of the village which comes from the occitan for 'between the waters'). There has been a village here since the 10th century, but the oldest parts we see today - the castle and the two bridges - date from the 13th century. 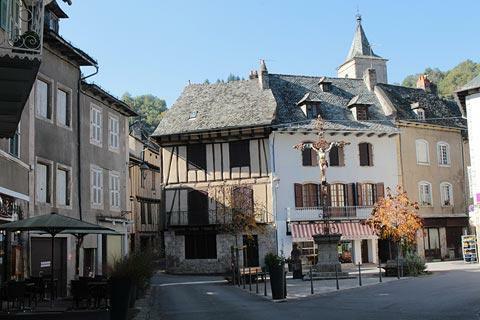 France This Way comment: in an attractive wooded valley setting, the historic part of Entraygues-sur-Truyere and the castle are surrounded by a bend in the Truyere River and the presence of the rivers and medieval village make Entraygues an interesting and charming destination. 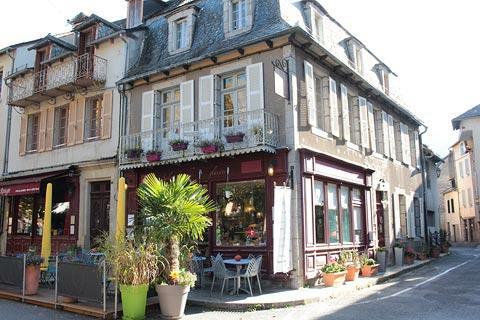 The Tourist Office in Entraygues is at the north of the town, next to the Place de la Republique where you will also find parking, so this is a good place to start a visit: you can ask for a plan of the village in the tourist office before setting off to explore. 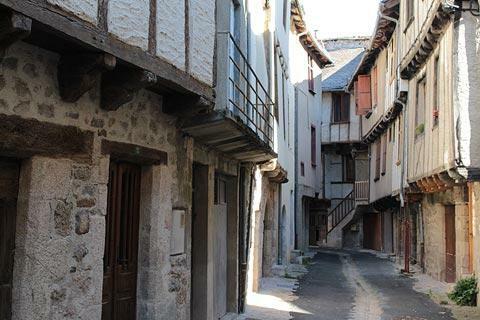 You quickly reach the old town from here along the covered walkway by following the fortifications and passed a tower that was also part of these defences, before returning to Rue Droite, the main street in the village in medieval times that leads to the Place Albert Castanié. 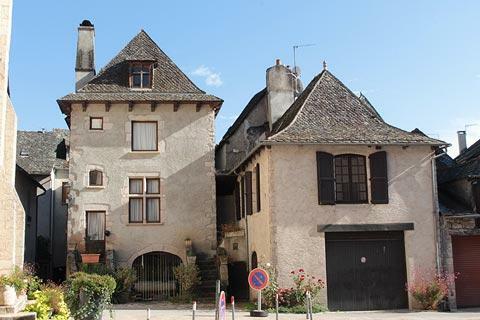 There is much to admire In Entraygues-sur-Truyere old town, with half-timbered houses dating from the 15th century and narrow streets to explore. 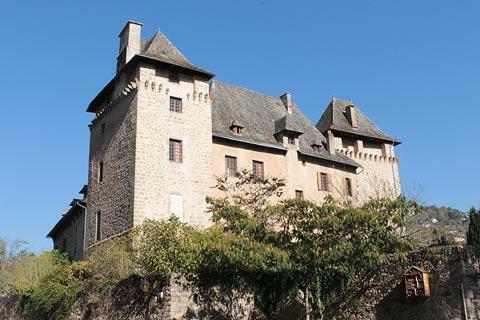 The current castle at Entraygues dates from the 17th century although there are also some remains from the much older, 13th century castle including the two imposing square towers. (The rest of the original Chateau de Entraygues was destroyed in the 16th century.) 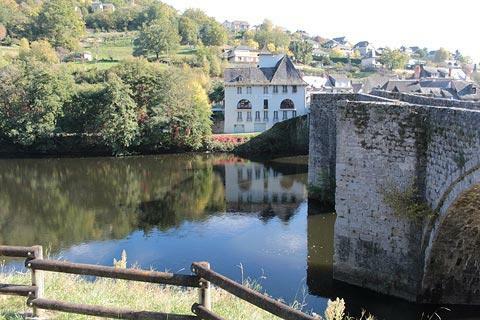 The whole town at that time was fortified, surrounded by a moat and entered by a drawbridge, but very little of the fortifications still exists. 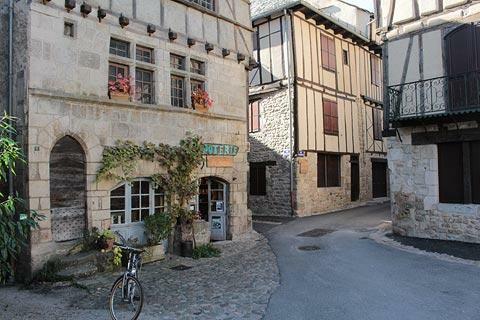 If you continue along the river you can re-enter the old town from the west along Rue du Pourtanel and continue to explore the quiet ancient streets such as Rue Basse and Rue du Chateau. 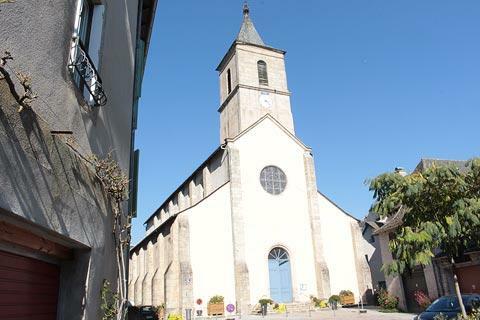 You quickly reach the church, built in the 19th century using stone from the original fortifications and towers. 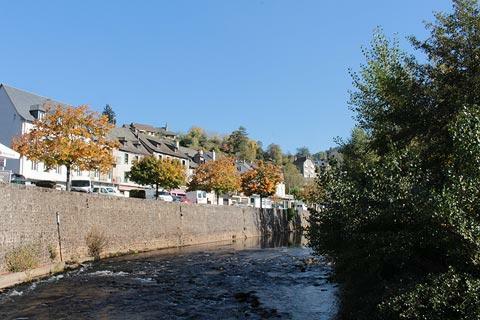 If you follow the streets to the left of the church you can see a traditional mill on the banks of the river Truyére before returning to your starting point. 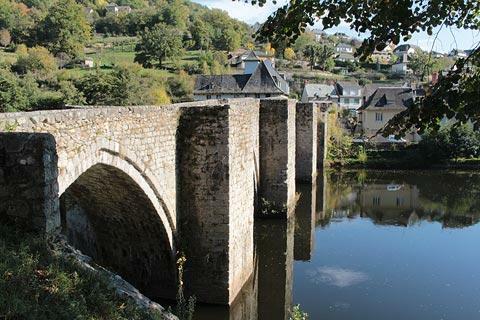 The river Truyere is also crossed by a scenic 13th century stone bridge (now a listed historic monument). 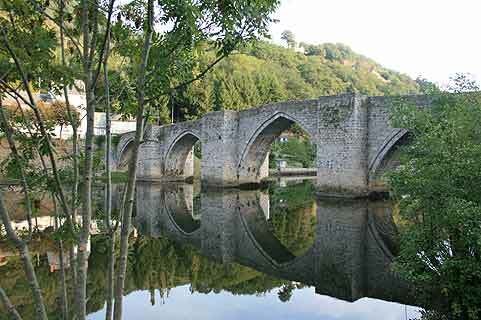 The bridge is in a lovely setting a few hundred metres north of the centre of Entraygues-sur-Truyère. 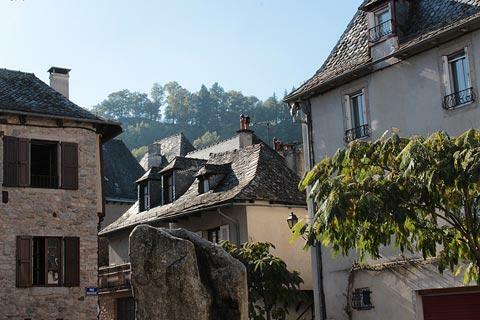 Entraygues is well placed for enjoying the region and there are several highlights neaby, including two of our favourite villages in France: Conques and Belcastel. 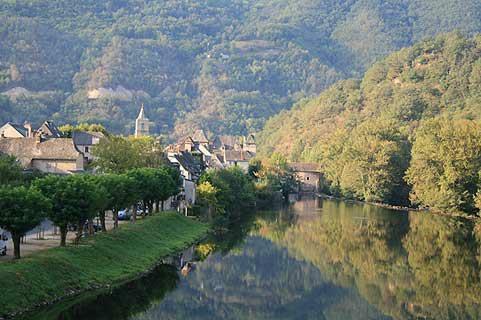 Even closer to Entraygues visit the small villages of Le Fel, Espeyrac, Golinhac and Saint-Hippolyte - each small and with no 'great sites' but with their own particular charms and Estaing, one of the 'plus beaux villages de France' is only 17 kilometres away. 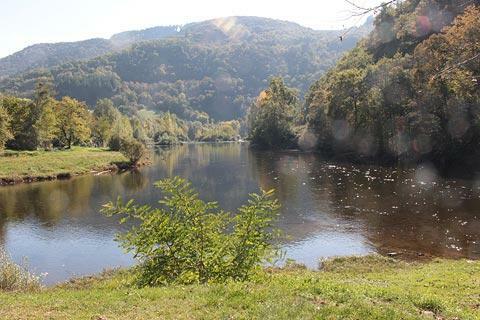 The Gorges de la Truyère lie just outside Entraygues, along the river valley, and are also a very scenic detour, along with the Lot Valley itself. Indeed, the countryside in all directions deserves exploring - there is little to disappoint! Regular market(s) are held in Entraygues each Friday &.